The N.S.S. 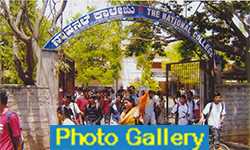 is a social service organization run by the Bangalore University. The N.S.S. wing of the College has its activities every Saturday in the afternoon. An annual camp in a village is conducted as part of the N.S.S. activities of the College. The motto or watch word of the National Service Scheme is ‘NOT ME BUT YOU’. This reflects the essence of democratic living and upholds the need for selfless service and appreciation of the other person’s point of view and also to show consideration for fellow human beings. It underlines that the welfare of an individual is ultimately dependent on the welfare of the society on the whole. Therefore, it should be the aim of the NSS to demonstrate this motto in its day-to-day Programme.
" To provide a value-based education to inculcate competitive spirit towards attainment of academic excellence "
" To provide holistic education that contributes to all-round Personality Development "